We got the fan shroud on today along with with some of the small items that go with it. 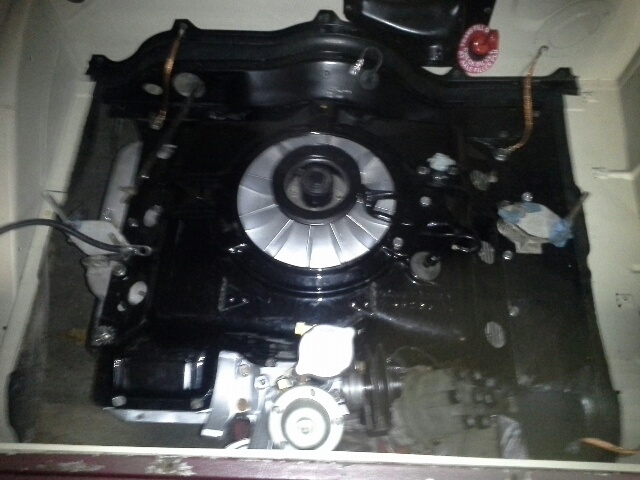 Starting to look like a Vair engine again. 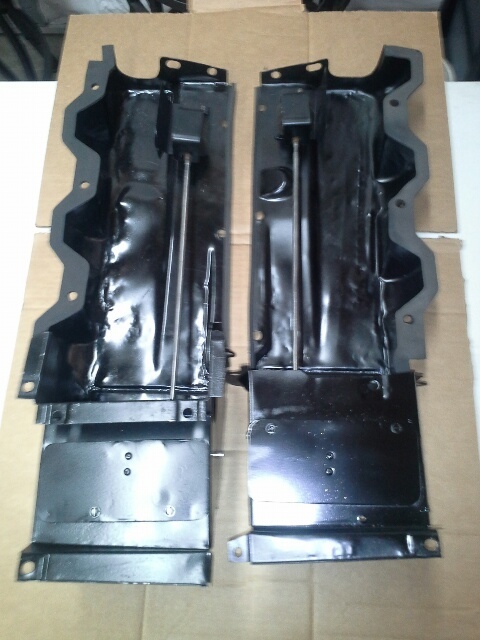 Finally got both lower shrouds and cooling boxes/doors ready for installation. Both cooling boxes now have Summer/Winter plates. Storage provisions (Grip-Serts) are provided on bottom of engine lid. Shrouds and cooling boxes/doors will be installed within the next couple of hours. The Rear Grille is now ready for install. It will be installed after the engine is run. Next owner gets to enjoy all your work! You two are quite the team! 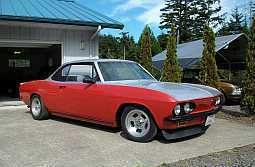 Hagerty will get some insurance money from me while I drive it around with for sale signs. Donna installed the seal on the left shroud while I struggled with the right shrouds and muffler mount. A PO welded the mount to the muffler. Rachet strap to the work bench helped out. Finally got time to post what we accomplished on the Greenbrier yesterday. Left upper shroud, lower shrouds and cooling boxes installed and doors connected. Left thermostat failed during hookup, so that slowed us up having to pull down the shroud to replace it. Fresh air duct and hose installed. We had to make a gasket for the duct to fan shroud as none could be found in my stock or online. Balance tube and upper vent tube installed. Accelerator boot/retainer installed. PG modulator tube blown out and new hoses installed. Distributor cap with plug wires installed. Reviewed rear seal retainers and their installations to figure out how they are assembled. Donna finally figured out that puzzle. Just an observation on the floorboard in the front. When the old carpet was removed, I found a clutch pedal still in the van. Laid flat on the floor still connected to its pivot. Good starting point to revert back to what it was, if someone is looking for a Greenbrier Deluxe van with a manual transmission. After working the day on my Camaro, came home and worked on the Greenbrier until 9 pm. Carbs have been installed with new gaskets and insulators. Throttle cross shaft installed and hooked up to both carbs. Choke rods installed and hooked up. Kick down linkage hooked up. Accelerator cable hooked up. Alternator and its rear support brace installed. I had to take alternator back off to rotate the rear case as the rear brace attach hole was in the wrong position. 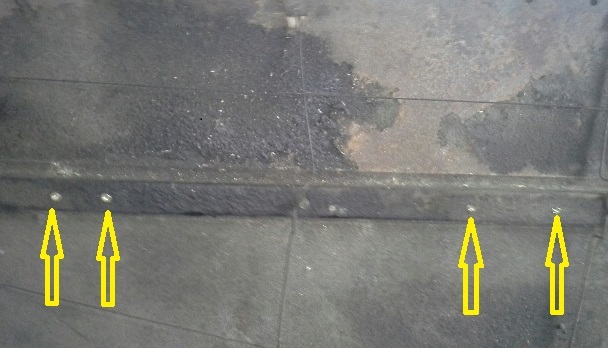 Ground cable was installed at same time. All in all, we got a quite bit down in 90 minutes. 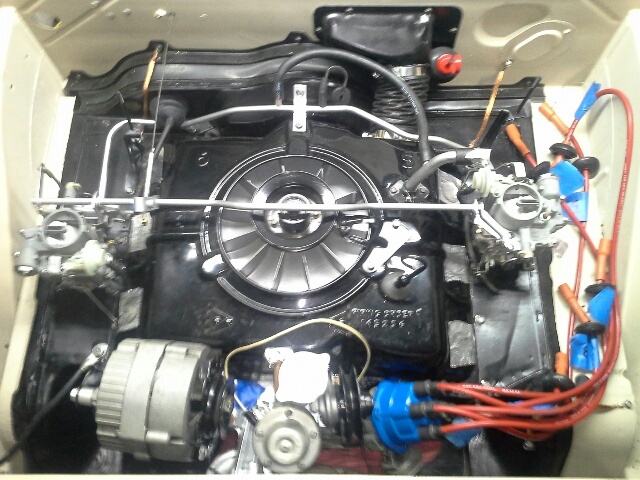 Next tasks are to install engine harness and body harness to prepare for the engine run. You're not going to drive it???? I drive my 64 FC nearly every day.......even though the heater is non-functional. I did drive it home (25 miles). It was not a peppy GB at the time. It will be when I finish it up. The intent was to grab the very good deal at the time, take the parts supply and use it on my Monza as there was many parts I could use. Sell off the parts not needed to get the Greenbrier back in roadworthy condition to help defray costs of getting parts the van really needed. Repair the Van to roadworthy condition and sell it. There was never was any intention of keeping it for a long time. 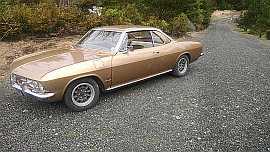 I will register and insure it, so I can drive it around with For Sale signs. It will make it easier to sell. I already have 3 vehicles registered and someday when the Monza is finished with its current engine, there will be 4. I was able to run the engine harness this morning. All is connected. Just have to mount the 2 junction blocks and run the new red power wire to the positive cable and splice it in. Fuel lines are hooked to carbs and main line is laying in its position. Awaiting grommets from Vendor before continuing with wiring and fuel lines. Had to stop to go work on the Camaro. Belt got installed today. Also got left and right body seal retainers installed. Uncoiled body harness, so it could breathe and relax it's coils in preparation for installation this weekend. Body harness replacement is in process. Old one is almost removed. Just got to disconnect at gas tank and at dash and slide it out of truck. New harness is routed up to behind gas tank area. Had to stop work to pick up travel trailer from Camping World following warranty repair of 48 discrepancies. We got the old harness out. We could not get to fuel tank sender. Cut its original wire and will use a plug in terminal to connect to new harness. New harness is routes to dash and connected. Still needs to be clipped in and connected to blower, fuel tank sender, horn and something by horn with two connectors by the horn. 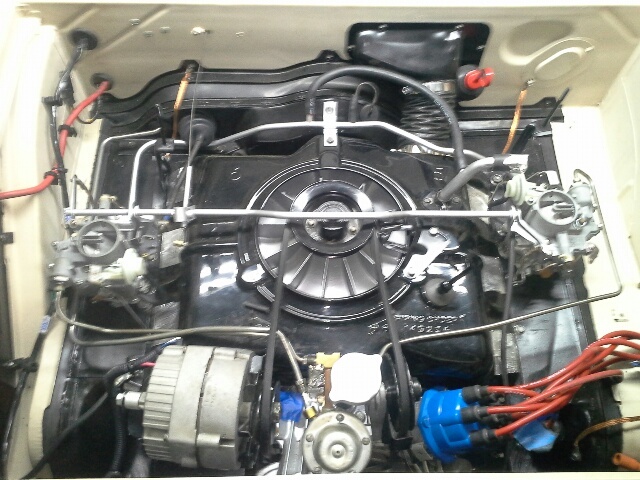 The engine harness is installed except for connecting the coil. I found a Flame Thrower II coil installed, so it has been removed. A good Delco coil is being cleaned and painted for the van. It passed continuity checks. 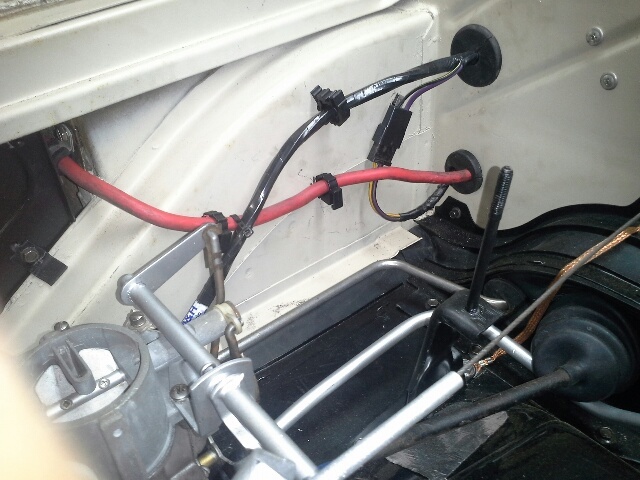 Photos shows the way i routed the fuel line, body harness, starter solenoid leads and the positive battery cable to the bay ahead of the engine. 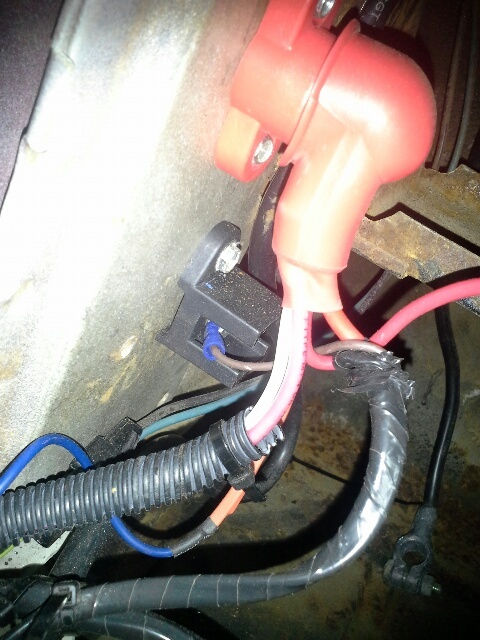 Also shows where i mointed the new junction blocks for the internally regulated alternator. I have to restock the wires on the red terminal to have less stress on the brown wire. And here is the new connection to the battery cable. Clean! I put a fusible link there. I could have added in a safety device but decided to get it together first. Still can be put in easy enough on the side panel. The red 10 gauge wire runs along the black side panel back to the red junction block. What rating fuse do you think - 60 amp? 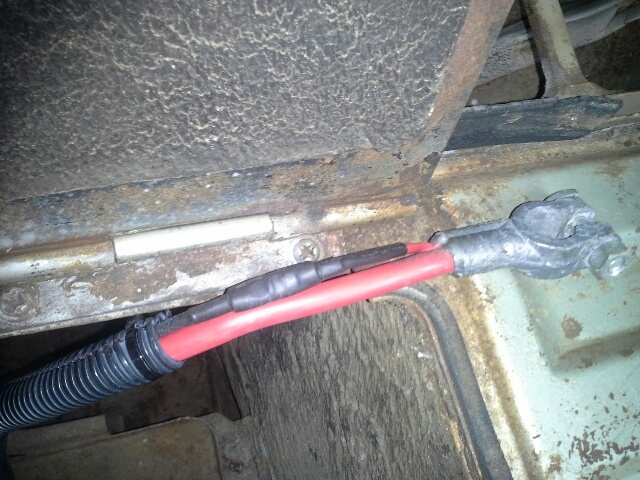 I can bring wire and fuse on engine side of panel to be visible. My Monza and Camaro will be getting a circuit breakers replacing the junction stud. The Monza will be getting a second circuit breaker for the separate hot wire being run for the headlights.